Charge: 1. Committing cruel and brutal atrocities against POWs 2. Failing to control, and permitting members of his command to commit cruel and brutal atrocities and other offenses against POWs. Reviewing Authority's Recommendations: The accused "could not but have known" that beatings were taking place for they were a daily occurrence at the camp. The deaths of several prisoners "must be attributed to lack of medicines, lack of clothing and being required to work when unfit to do so. For these the accused may propersly be considered as responsible." The JA also comments on the following about the commission's recommendation for clemency dependent on accused's age and "inadequacy," based on his training as a field grade officer rather than a company grade officer. "Responsibility for crime does not rest on inadequacy or age and age or inadequacy do not offer any cloak of immunity for criminal acts" because these offenses were "violation of the prisoner of war conventions and of the fundamental concepts of human decency." Defense Arguments: 1. Common for superior officers to slap or strike juniors 2. Had no authority to punish civilians employed at the factory. He notified the overseers about the correct treatment of POWs on several occasions. 3. Rations were regulated by orders from superiors. POWs received same rations as Japanese soldiers in base camp 4. Guards were not authorised to beat prisoners, to burn them or require them to stand at attention for long periods of time. 5. "Fitness to work" was decided by a set of standards arrived at by agreement between the prisoner and Japanese medical officers 6. Denial of knowledge concerning specifications of abuse. 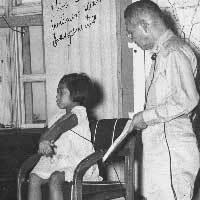 Judge Advocate's Recommendations: Prosecution argued that the accused, "as camp commander, was responsible for the administration of the camp and the conduct of the Japanese military and civilian personnel at the camp and at the factory where the prisoners worked."